Shavuot. What, why, where, when…. The Holiday of Shavuot has no specific date in the Torah. The Torah tells us “Count 50 days from Passover this shall be the Festival of Weeks (Shavuot)”. 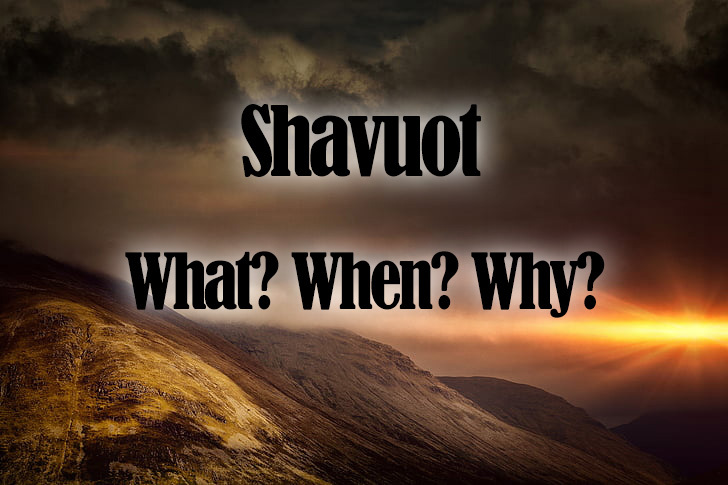 So, what is the holiday of Shavuot all about and why does the Torah not state a specific date for it? Unlike other holidays that have an obvious theme, the spiritual significance of Shavuot is that we received the Torah from God on this day. Many religions have stories of revelations that happened to one person or a small group of people. However, Shavuot is the experience of National Revelation – that the entire nation of the Jewish people heard God speak to them. It wasn’t just Moses who experienced the revelation. In fact, the Torah is very specific by saying that at this time Moses was told by God not to be on Mount Sinai but, rather, to be with the people. So why is no specific date mentioned? Frequently in life we are results orientated, what counts is the bottom line. Sometimes, the journey is just as important, if not more important, than the destination. As a nation we had to undertake motivated personal growth (undertaking the journey of spiritual development) for 50 days leading up to Shavuot. We had to be ready to accept the Torah on Shavuot at Mount Sinai. We learn that on that day the Jewish people achieved a special place “Ish Echad Blev Echud” (One nation with one heart). We put aside our ego and become a united community. May we be blessed to focus on the journey rather than the results and that we can find meaning in this gift we call the Torah.